Things I hear I forget. Things I see I remember. Things I do I understand. In May 2014 during the 53rd Diocesan Synod of the Kumasi Diocese of the Methodist Church in Ghana, the Right Reverend Professor Osei Safo-Kantanka, Methodist Bishop of the Kumasi Diocese, added his voice to calls for Ghana to focus on hands-on training for the youth. He reiterated, “The country cannot develop if we do not develop our hands-on technical and vocational education.” He advocates for scholarships to be given to students pursuing technical and vocational education. The Ghanaian system of education coupled with limited financial resources has compelled many, especially public schools to rely heavily on text books for teaching and learning. Teaching of subjects such as information and computer technology, engineering, agricultural science are about 70 percent textbook-based with limited opportunities for practice. This has adverse effects on the quality of Ghanaian graduates; they hardly fit into the job market let alone being prepared to start their own small operation. This has contributed to an unemployment rate of more than 40 percent among graduates and low gross domestic product. From afar the situation looks hopeless but it is never too late to make amends. People trained at the Frances Mueller and Virginia Lageschulte Training Center (FMVLTC) are proving that people understand better and are more willing to practice when given hands-on training. Kofi is 28 years old and a pupil teacher. In 2013, in his quest to earn higher income, he enrolled at the University College of Education in Kumasi-Ghana but withdrew due to financial challenges. He enrolled at the FMVLTC in June 2014 and is currently raising rabbits. He now has a reliable supply of protein for his family and additional income to continue his education. Kofi with the rabbits he is raising. St. Peter’s Roman Catholic Junior High School at Toase received training at the center in March 2014. After the training the headmistress, Mrs. Mary Magdalene Wompakeah, was more convinced than ever before of the need for hands-on training and won the confidence of the PTA for the school to continue practical education at the center. Currently, the school is embarking on mushroom production in collaboration with FMVLTC. The children are enthused about the fact that mushroom production is well within their capabilities. Traditionally, Ghana’s supply of mushrooms have come from the wild but this source has witnessed a sharp decline in recent times and the need to find a reliable supply is urgent. Mushrooms, snails, and cocoyam, though seasonal, used to be in abundance a decade ago but have witnessed population decline due to climatic changes and use of agro-chemicals which in many cases are wrongfully applied due to inadequate hands-on training in their application. With proper training there is great opportunity for students pursing mushroom cultivation today. Because of supporters like you, many young students have the opportunity to receive hands-on training and acquire new, useful skills through the Frances Mueller and Virginia Lageschulte Training Center. 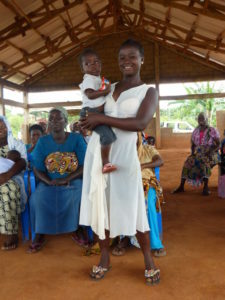 Like Kofi, they can put their new skills to use to better provide for their families future.